Last night I had some down time so I figured I'd continue on my quest to rewatch all of the Disney renaissance films that I vaguely remember from my childhood but am incapable of recalling clearly enough to have an opinion on. Next up on the list was Hercules, which I dimly remembered was never one of my favorites, but didn't otherwise have any strong feelings about. So I watched it, and now I remember why I didn't have any strong feelings about this movie. There is pretty much nothing in it to have strong feelings about. Or, rather, there is content in there, technically, but not a whole lot that's worth remembering or profound in any way. In fact, I would argue that this might be the most forgettable of the second tier Disney movies, if only I could be sure there's not something more forgettable that I've already forgotten. The problem with the film isn't so much that it's bad as that it's not good. What I mean is, there's nothing in this movie that is objectively terrible, but by that same token, there's really nothing in this movie that is worth special praise or notice. The story is okay, the animation style is really visually interesting but not particularly earth-shattering in its innovation, and the voice acting is fine. Nothing really to write home about, except for James Woods' memorable turn as Hades. In other words, there's nothing really in this movie that makes it remarkable in any way, and it's not quite solid enough to fade into the background of respectability, like The Hunchback of Notre Dame or Lady and the Tramp. Neither of those is considered one of the best Disney films, but they're both respected. 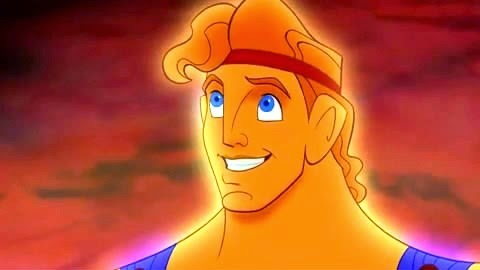 Hercules, however, barely gets that most of the time, and having watched it, I can see why. The story is based loosely off of Greek mythology and the Hercules/Heracles* story. Now, in mythology, Hercules was the son of the god Zeus and a mortal woman, Alcmene. He's therefore not a full god, but a demigod, and there are tons of those running around. Seriously in Ancient Greek mythology, finding out that your parent was actually a god seems akin to finding out that your parents went to Woodstock or something. It's surprising, maybe, but not exactly a big shock. The film changes this and Disneys it up a bit. Here, Hercules (Tate Donovan) is the son of Zeus (John Goodman) and Hera (Samantha Eggar), which makes him a full-blooded god. 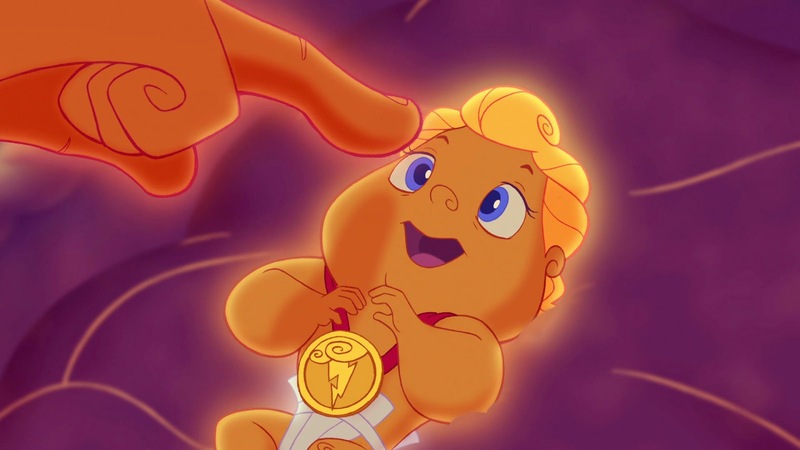 And everything's going swimmingly with this adorable little bouncing babe until his uncle, Hades (James Woods) gets jealous and decides to kill Hercules. Since he can only kill a god when the moon is just right, Hades sends his two minions, Pain (Bobcat Goldthwaite) and Panic (Matt Frewer) to kill the kid. But they fail. Before they can finish giving Hercules the potion that will make him forever into a mortal, Pain and Panic are interrupted by a nice married couple, who see the baby and adopt him as their own - conveniently discovering that his name is Hercules so that no one gets confused by the kid having two names. Pain and Panic realize what happened, but decide not to tell Hades because he will probably react poorly. Then we cut to fifteen years later or so, where a pubescent Hercules is the menace of his town. Not because he's mean or anything, but because he still retains his godly strength but has mixed that with the physical awkwardness and gangly limbs of an early adolescent. He ruins things. A lot. Like whole buildings and towns. His parents decide it's time for Herc to find out who his real family is, and they decide to send him off to the Temple of Zeus. How or why they know to do that is completely beyond me and beyond the reasonable scope of this film's logic, but whatever. Hercules shows up at the temple and Zeus appears to tell him that he's his dad and Hercules needs to become a great and mighty hero in order to be a god again and come back home. Because those are the rules, I guess. Makes total sense. Sure. Hercules goes off and trains with Philoctetes aka Phil (Danny DeVito) until he's about eighteen, and then the plot, such as it is, really starts. Hades is trying to take over Mount Olympus, Hercules is the only hero who can stop him, and oh by the way, Hercules is quickly falling in love with Meg (Susan Egan), who unbeknownst to him works for Hades. Blah blah blah, heroic actions and love interests and singing blah. Honestly, that's what the rest of the movie feels like, because once you reach a certain point in the story, it feels like it's completely over. Hercules is now the hero that everyone thought he could be and that's that. Oh sure, Meg is kind of evil and he should be worried, but we all know that Meg is going to ultimately fall for Herc's down home charm and aw shucks humility. Hades is planning to overthrow Mount Olympus, but Hercules is totally going to stop him, no matter what macguffins or minor obstacles Hades throws his way. For all intents and purposes, by the midway point of the movie, the film is over. 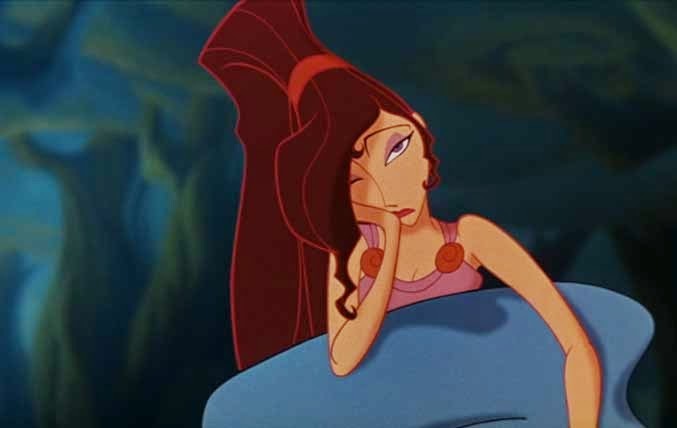 In fact, I would argue that from the middle of the movie on, the protagonist is no longer Hercules, but actually Meg. She's the one who has to change her perspective on life and go through a narrative arc so she can grow as a person. She's the one whose emotional journey we track. 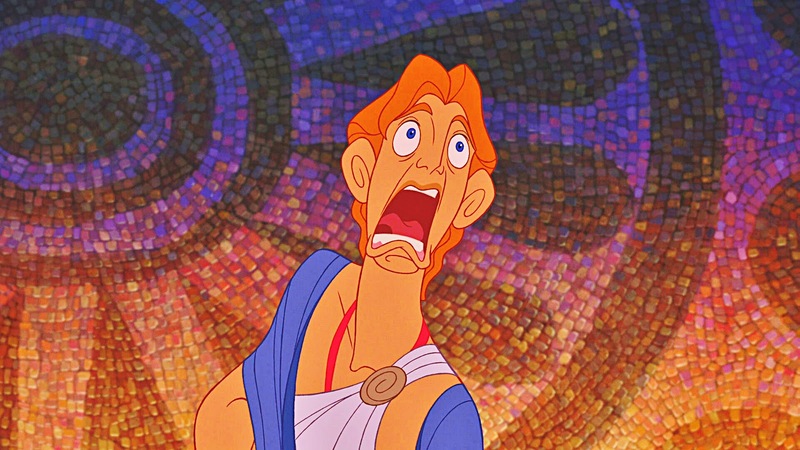 Hercules emotional journey in this movie is literally: I want to find out where I belong. I have found out where I belong but I have to do a few things to get there. I did the things and now I feel like I can belong anywhere. Good for me. Meg's journey, on the other hand, is much more complicated and emotionally delicate. We learn that she's guarded and not interested in emotional entanglements when we meet her, but it's much further into the film when we learn that Meg actually sold her soul to Hades to save the man she loved, who then dumped her immediately afterwards. So yeah, she's guarded. Her journey, of coming to love Hercules enough to sacrifice herself for him, then becomes something both deep and meaningful. It's just, unfortunately, buried in all this other mediocre crap that the film seems to think is more important. Like jokes about Hercules' merchandizing and action figures. Or repeatedly insisting that being a famous hero has not made Hercules at all stuck up or conceited. Or funny haha jokes about Phil constantly trying to sexually harass nymphs. It's like the movie didn't really know what to do with itself. Once it got Hercules started on his journey, it stagnated because Hercules as a hero is not nearly as interesting as Hercules as a screwed up teenager. In fact, Disney even recognized this fact after the film was a mild flop, and made their animated television sequel about Hercules as a teenager, going through training and generally being terrible at everything. Because that's what we want to see. Sure, there are a lot of really funny jokes in the film, like literally everything James Woods says as Hades, and half of Meg's lines, and a lot of the Pain and Panic stuff. But it's a problem when your bad guys are so much funnier and more engaging than your good guys that you actually want them to win. And for all that I stinking love the Muses in this film, they don't really add to the narrative. They cover over a lot of the more egregious plot sins, like how Hercules has no emotional arc to speak of and is a very boring character, but that's not necessarily a good thing. In short, the biggest problem this movie has is its hero. And that's not something I like saying. It's not that I think Hercules is a bad movie or sets a particularly bad example for the children who might be watching it. I don't think that. It's fine. "Find the hero within you" is a perfectly decent message to send, and while I think the movie is only okay, that doesn't make it bad. No, the real issue I have here is that Hercules feels symptomatic of a problem I see a lot in children's media: no one cared enough to make it good. That's what this really feels like. No one took the time or effort to really look at this movie with a critical eye and see that it's not nearly as good as it could be. It's like they were so set on an idea of what the movie was going to be and how it would sell for them that they forget to check and make sure it was halfway decent before putting it out. I really hate that. I hate the idea that just because something is for children we somehow assume it's all right if it's not very good. That's crap. Kids have taste too, and if you wean them on media that doesn't have a high opinion of their ability to process good media, then they're going to feel stifled and annoyed and probably get the impression that media is worthless overall. Which it isn't. Also, in keeping with yesterday's theme, I do really think this movie would have been much more compelling if it were openly about Meg rather than Hercules. Meg's emotional journey and backstory are way the hell more compelling, and her journey is the one I really invested in. So make that a movie, please, and leave Hercules and his arc-less character alone. 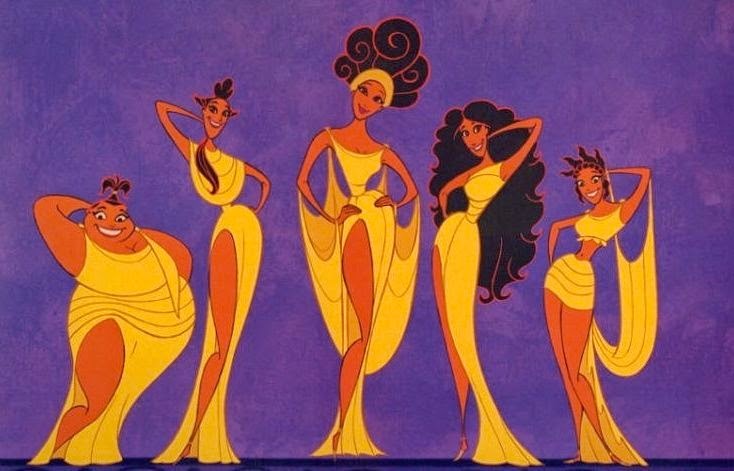 I want them to sing-narrate my life. *Hercules is actually the Roman name for the hero. As you might recall, Roman mythology is literally just Greek mythology with the names changed (so is Etruscan mythology), so Hercules is the same as the Greek hero Heracles. I assume Disney used the Roman name because it is better known. Don't worry! You forgot lots of other forgettable things! BUT this movie did bring us baby Pegasus plush merchandise so it was worth it! Okay, well that does sound adorable. And if I ever get around to writing a book, you get to be one of my alpha readers. No, you don't get a choice. I feel honored. I think. I hate the idea that just because something is for children we somehow assume it's all right if it's not very good. Have you seen Adventures in Time and Space? I think you would like it. Oh man. That looks super adorable. Thanks for the tipoff! Yes! I totally agree. By trying to skirt around anything even vaguely controversial they got rid of everything about the movie that was actually interesting. I mean, why do a Hercules story if you're going to get squeamish about everything actually in the story? View this great app that is called flexispy and helps you to track anyone you wish.